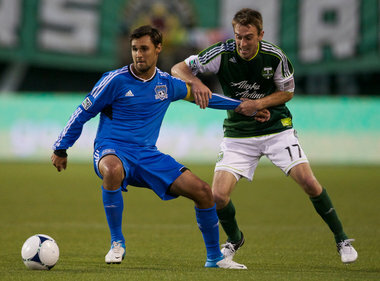 Randy L. Rasmussen/The OregonianPortland Timbers' Eric Alexander restrains Earthquakes' Chris Wondolowski as the Timbers won, 2-1, at Jeld-Wen Field, July 3. Fresh off their most recent Cascadia Cup clash, the Portland Timbers travel to San Jose to face the league-leading Earthquakes Wednesday evening at Buck Shaw Stadium (7:30 p.m., KPDX). The cards appear to be stacked against the Timbers in this match: on the road against the top scoring team, while missing Donovan Ricketts and Diego Chara to injury. Recall, though, that back in July the Timbers were coming off an embarrassing loss to Colorado before they defeated the red-hot Earthquakes. Will the Timbers, who are still winless on the road this season, pull off an even greater upset and take down the leaders on their home turf? Or, will this match resemble many other road games for the Timbers. Post your predictions below. Timbers 0, Earthquakes 2. San Jose has been flying a bit under the radar with many soccer fans, but the soccer media have noticed how quickly the Earthquakes have turned things around after their struggles in 2011. San Jose currently leads the Western Conference with 56 points, a full 8 points over the second place Seattle Sounders FC, and they are tops in the league in goals scored. Granted, when you have one of the best pure scorers in MLS in Chris Wondolowski, that shouldn't surprise anybody. However, San Jose has witnessed Alan Gordon, Steven Lenhart and Simon Dawkins also contribute goals to the cause while 16 different Earthquake players have registered assists in 2012. To say this is an offensive juggernaut is an understatement. What has helped the Earthquakes is an improved defense with Jon Busch taking over the top goalkeeping spot while their defensive line has been outstanding in keeping the goals allowed average near the top of the league. Portland would have enough of a challenge already in traveling to the Bay Area, but there are additional situations that make this an extremely difficult match for them to steal any points within. The Timbers remain winless on the road in 2012 and news is that Diego Chara and Donovan Ricketts will be out for two weeks for injuries suffered against Seattle, and Ricketts could be out longer depending on the severity of his shoulder sprain. Goalkeeper Joe Bendik steps into goal for the Timbers, and I would expect Eric Alexander to step in for Chara, but there are rumors abound there will be more changes forthcoming. I'd be ecstatic if the Timbers could somehow earn a draw in the midweek match, but I feel the Timbers will unfortunately continue their road futility for another match. Timbers 1, Earthquakes 4. As much as I like to remain optimistic, our road record is not brilliant. Neither is the fact we will probably go through another two or three keepers in the next week. Unless a massive earthquake opens the ground and swallows up San Jose, I don't see this being a very good result for us. Before I would have made a prediction with us with a win, because in the past we had been able to do amazing things at the least expected times, but the last time I said that we still lost. I always hold out hope, but I'm not expecting to be thrilled at the final whistle. Timbers 0, Earthquakes 3. In their last six matches, San Jose Earthquakes are 4-1-1, have scored 14 goals and conceded six and are 10-1-3 at home this season. The Timbers' fortunes have been a little more mixed with a 2-2-2 record that includes nine goals for, 10 against. The difference in firepower between the teams is staggering. San Jose leads the league in goals scored at home this season with 36. Conversely, the Timbers are at the foot of the road goals table with six. The loss of Diego Chara will hurt the Timbers and expose our back four to the Earthquakes' goal grabbers Chris Wondolowski (19 goals this season), Alan Gordon (12), Steven Lenhart (8), and Simon Dawkins (7). Gavin Wilkinson has hinted at changes for this match which could see Kris Boyd and Danny Mwanga starting up front. Timbers goalkeeper Joe Bendik will be making his first MLS start in place of the injured Donovan Ricketts. Given our form on the road this season I don't see the Timbers holding out and bringing any points away from this match. However, there is one light at the end of the tunnel. In their short MLS career the Timbers are unbeaten against three teams and San Jose (1-0-2) is one of them. Philadelphia and Vancouver are the others. Timbers fans, share your final score predictions and how you think this match will play out in the comments below. Stats to skew perspectives i agree but these are optional and depend on the various different conditions and elements.